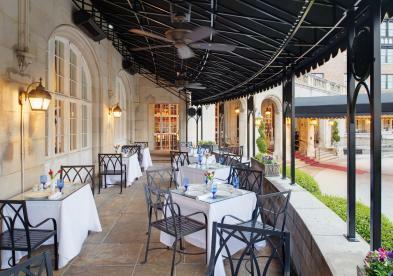 The Hotel Roanoke & Conference Center, Curio – A Collection by Hilton, is where history meets the future. Today, the fully-restored Tudor-style Hotel Roanoke is proudly listed on the National Register of Historic Places and is a proud member of Historic Hotels of America. As a member of IACC (International Association of Conference Centers), Hotel Roanoke is pleased to offer world-class lodging facilities, including newly renovated guest rooms and 63,000 square feet of state-of-the-art conference space. The hotel's business facilities include 35 meeting rooms, a fixed-seat lecture hall, two boardrooms, conference center lounge and an elegant hotel ballroom which can accommodate up to 1,400 guests. The Roanoke Valley boasts a wide variety of golf and tennis facilities, as well as great outdoor recreation with hiking, biking, boating and fishing in the surrounding Blue Ridge Mountains. And those who would like to adventure closer to the hotel can head downtown for its galleries, shops and a famous Roanoke Farmer's Market which offers the best in cultural arts and culinary specialties. So no matter what your reason for staying at the Hotel Roanoke and Conference Center, your comfort is guaranteed.